Peru – the land of the Incas. It has everything – beautiful valleys and lakes, lush rain forests, crumbling ruins, world wonders, and an eclectic vibe in the air. Peru, for me, is a perfect amalgamation of nature and the man made. It’s like the Incans were the perfect artists – architecting structures to weave around the natural landscape, gloriously elevating its beauty. We flew into Lima, the most popular and economic connection into the country. Lima is all about the beaches, coastline stretching for miles, green parks and promenades, and shopping. It’s relatively easy to get across the city, we used a combination of walking, local buses, and Uber. We stayed at the Pariwana hostel in Miraflores, the safest part of town for tourists and the prettiest. Miraflores district has beautiful parks and a very active artistic community. My favorite is the Parque Central de Miraflores, and Parque Kennedy, which have sprawling gardens, creative art installations, and great views of the Iglesia La Cuidad church. Locals come here to put up their plethora of wares and paintings, all of which made for a very pleasant evening taking in the cultures of Lima. Barranco is Lima’s bohemian district – think quirky street art on walls and under bridges, eclectic eateries, colorful houses, and parks where artists and musicians create their masterpieces. We walked across the Puente de los Suspiros (the Bridge of Sighs) – originally built to connect streets across a gorge and now one of the most popular landmarks in Lima, along with the overlooking hermitage park, and Bajada de los Banos. After lunching at Las Vecinas in Barranco (highly recommended for vegetarian/vegan travelers), we headed back to Miraflores for our tour of the Huaca Pucllana ruins – an ancient clay pyramid, built by a lost pre-Incan civilization as a settlement to support irrigation sites. The ruins juxtapositioned with the modern high rise buildings of Lima is a sight to behold. Next, we headed towards Larcomar – if you think shopping against sunset views of the coastline is a great idea, this place is a dream come true. Walk-able distance from Larcomar, continuing along the coastline, is the Parque Salazar and Parque del Amor (you guessed it, the Love park), which are worth a visit. We ended the day with the amazing fountain show Circuito Magico del Agua at Parque de la Reserva. Cusco – the bustling capital of the Incan empire. One can feel it’s rich history in the walls that date back to many centuries, and alleyways of colourful people in their local attire. Even much of the modern infrastructure is built on top of Incan era base structures and stones, making Cusco the perfect destination to lose your senses in Peruvian aesthetics. Cusco is at 3400m above sea level, so its going to take a few days to acclimatize to the altitude. I recommend taking it easy for the first couple days, and drinking copious amounts of the coca leaf tea for altitude sickness relief. We stayed at the same Pariwana hostel in Cusco; I cannot recommend this hostel enough – they have great food and accommodation, a fun crowd, offer tours, and even a discount if you book them in more than one city. Saqsaywaman – an ancient ceremonial center, made of stones cut from limestone. This one is a strenuous uphill climb. Puca Pucara – the remnants of what could be a strategic lookout post between Cusco and the Sacred Valley. Qenko – this site is a large rock formation called Huaca, and believed to be used as a temple of sorts used for celestial observation and ceremonial rituals. Tambomachay – nicknamed, “Bath of the Inca” due to presence of thermal waters being channeled, and likely used as a ritual bathing site for the Incan elite. For a reasonable price, you can find local taxi’s that will take you to each spot and drop you back at the hostel. The Boleto Turistico pass gives access to all these spots and more. El Valle Sagrado or Sacred Valley is a peaceful corner of the Andes, with colorful colonial towns and remote weaving villages. Pisac – a hilltop Inca citadel with agricultural terraces sweeping across the landscape, curving along the plateau. 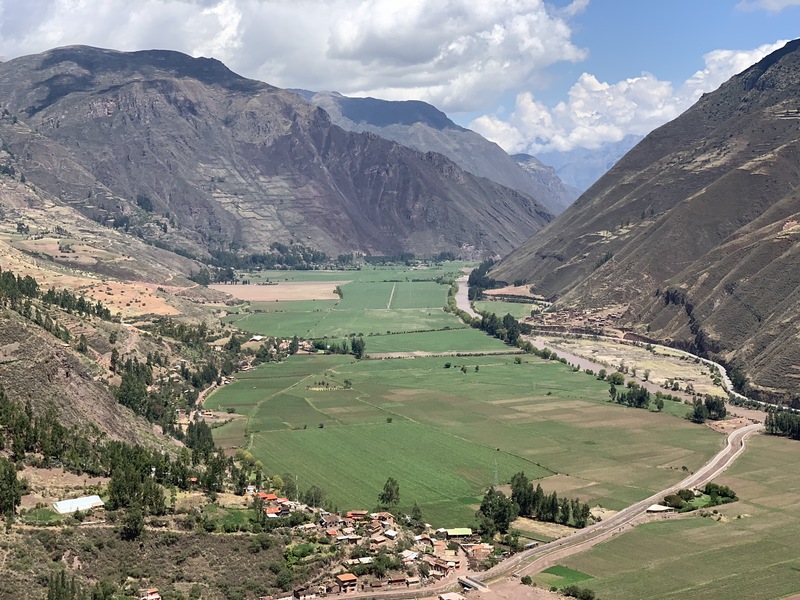 Urubamba Valley – Set against the backdrop of the stunning Urubamba valley, and amidst gardens where alpaca’s grazed, we had lunch at a local buffet restaurant. Ollantaytambo – A well preserved, ancient fortress of the Incas, with incredibly tall terraces that climb to the sun temple. There are also ruins of the village, ceremonial center and agricultural center. Well worth the steep climb, and easily one of my favorite spots on this journey. Chinchero – A remote weaving village. Over hot coca tea, our guide walked us through the process of making and dying wool yarn from adult and baby alpacas and llamas. They had a huge amount of alpaca blankets, scarfs, sweaters, woven bags, and hats and gloves to choose from, and it was quite the shopping experience. 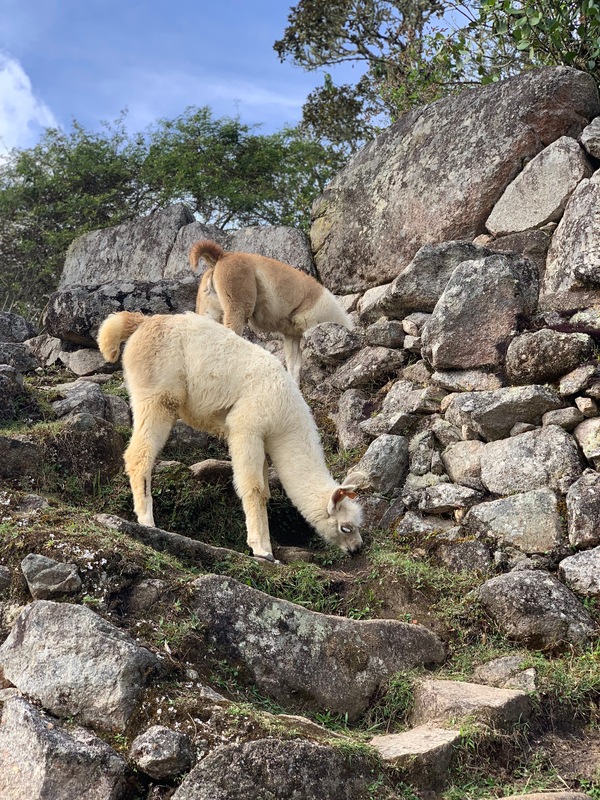 With the endless opportunities to explore the Peruvian landscapes, and cultures both ancient and living, we thoroughly enjoyed our journey through Sacred Valley. One of the most spectacular sights in Peru, and one that really took my breath away, is Salineras de Maras, or the Salt Flats. Nestled in the valley high in mountains, are thousands of salt pans used since Incan times. To this day, locals extract salt and scale down the mountains with huge sacks of salt, that are sold world over. This one was truly a sight to behold. We then embarked on a unique way to experience the Peruvian landscape – driving ATV buggies for miles, on our way to the ruins at Moray. Definitely take this path down to Moray if you have the time. I was grinning to the nines the whole time, this ride with breathtaking views of the Andes gave me such joy! The ruins at Moray is an amphitheater like circular terrace structure; going into the actual site isn’t allowed in order to preserve it, but you can walk the entire loop at the surface. We spent this day exploring Cusco – the city center at Plaza de Armas, hidden alleyways, museums and attractive markets. 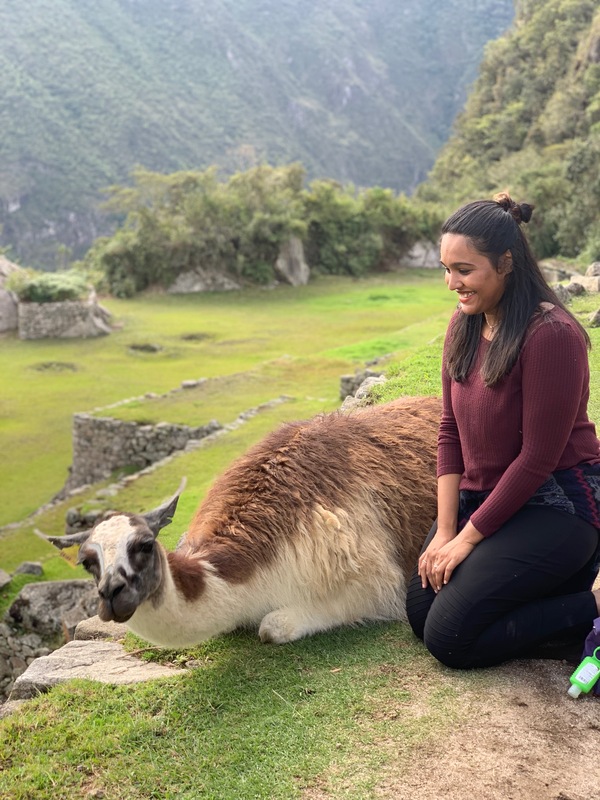 We met locals in their colorful attires, walking alpacas, and allowing their pictures to be taken for a few Peruvian soles. Wares of the day – take your pick! We kept Machu Picchu as the last destination we would visit to end our trip with a bang. We purchased the afternoon (12pm – 5pm) entry ticket, and took the Peru Rail from Cusco (Poray station) to the sleepy little town of Agua Calientes, at the base of the Machu Picchu mountain. Around 200 stone structures come together to form the temples, ritual bathhouses, aqueducts, huts, and gardens where alpaca’s roam freely. Among the popular spots are Intihuatana (the Sun temple), the Sacred plaza, the Inca Bridge, the Watchman’s hut, the Funerary stone, and many more. You can just get lost exploring this place, until an Alpaca sneaks up behind and scares the living daylights out of you. This was our last day before boarding our flights back to reality. We chose to take it pretty slow, exploring the sights of Agua Calientes. The town has limited food choices, and frankly, is quite overpriced. Nonetheless, we found a quaint little bakery with a great view of the mountains. There’s a hot springs in this town, providing a fun and relaxing way to spend a few hours after the laborious journey that is Machu Picchu. We took the evening Peru Rail back to Cusco, in time for our flights back. With that, here’s me signing off! As always, thanks for reading. I really enjoyed this article! My boyfriend and I are planning a trip to Peru this upcoming year, and we heard such negative reviews on Lima. I’m glad you had and shared your positive experience of the city. Peru is on my 2020 travel list and this article will be helpful with planning! Peru might be far away from my continent my would be great to visit it once while it is still there. Things are changing more faster and not mostly for the good. Paying a visit would mean a lot. Although I prefer slow traveling and not running from one place to another, it seems like 10 days in Peru is enough time to visit all the main sights. I am writing down 10 days for my Peru visit. Thanks. Btw, love your smiling face in the photo with the Alpaca. This is amazing! My mom has been to Peru twice and loved it. Thank you so much for sharing your trip! I always think of Machu Picchu when I hear Peru, but there is so much more to it. Pictures of the terraces and Incan ruins from all over the area always blow me away — there’s nothing quite like it. The ATV ride sounded like a lot of fun. Wow, Peru has an incredibly diverse landscape – I had no idea it was varied! I think I would really like Barranco since I tend to enjoy more bohemian flair. But everywhere you visited looked amazing! This was a wonderful place to visit, i was always intrigued by the Macchu Pichu mountain. I’m so jealous! I’ve been wanting to go to Peru for ages! Wow, Peru is great place indeed. I would really love to have a slow or long vacation here. Wow such beautiful landscapes. After reading your post, I think Peru should be on my bucket list. Absolutely gorgeous. Somewhere I’ve wanted to visit for a while. I worry about language barriers while traveling. Thoughts? My younger brother has been wanting to visit Peru ever since a group of students in his school went for class. I haven’t planned a trip yet because I don’t know enough about it! Thanks for the info! What an amazing trip this looks like! Thank you for sharing your adventures! One day I plan on being a world traveler and love seeing everyone else’s experiences. I know a handful of friends who’ve visited a number of these locations in Peru. They’ve all loved the views from above. So many beautiful sights to see. Peru looks absolutely stunning and breathtaking! I can only dream about visiting one day. Peru is on my bucket list. Loved reading the details of the trip. Looks like a wonderful itinerary to explore the place! This is a wonderful and looks absolutely stunning place to visit. Wow, I had no idea Peru is such an amazing place to visit. Thanks for the blog post and the stunning photos. Would definitely add to my list of countries to explore. The picture of you and that cat at the market is the most adorable thing I’ve ever seen !! :3 Peru sounds like such a wonderful place to visit and looks it too!